This was one of my more highly anticipated books of last year (because hello? Fairy tale freak. This is not news to anyone. ), and it's sort of shameful that I am just now posting a written review. (Though yes, I did have a mini vlogged one here. But still.) I feel like I've talked about this book a lot, but nothing's all official-like until I write about it. So. This was my favorite Jackson Pearce book to date. I've enjoyed everything I've read by her, but there's always been something a teensy bit off for me, especially in her endings. As short as her books are, they seem to lose steam a bit at the end, which is disappointing on its own, of course, but more so considering how much I enjoy them up to the steam-loss. But while Fathomless isn't perfect by any means, its come the closest to being exactly what I wanted from it. It has this really good dark streak that is perfectly suited to both the original tale and to the world Pearce has set up in her retellings series. There's this quality of a car crash in remarkably slow motion, a great sense of foreboding over the whole story, that creates excellent tension, and Pearce uses that to get at the unhappiness and emptiness at the core of The Little Mermaid - and is it weird to say I was so very happy to see that? This aspect is one of the things I potentially love most about a fairy tale retelling (especially one as dark as TLM1), but it's also often one of the most disappointing and neglected aspects. Modern audiences are so out of touch with original fairy tales that retellings that make use of the actual endings and tones are considered novel and creative, rather than traditional. We've been Disneyfied, and I'm on a tangent, so I'm going to rein myself in and just wrap that up by saying, I love it when a retelling is more traditionally bleak2... Fortunately Pearce capitalizes on it, to which I say THANK GOD. This is what I wanted from a TLM retelling. It's a little off. It's a little disturbing. Perfect. This complements the rest of the series very well, but can also be read completely as a standalone, which is excellent for readers wanting who've been wanting to pick these up, or even just Fathomless specifically, but weren't sure about making a series committment. Though all of the stories are linked, and they will expand the readers understanding of the rest, they work perfectly as potential companion novels to be read on their own. You don't have to feel tied down by them, or obligated to read them (to know what's going on or to have closure), which is something I really like from a series of this type. So if you've liked Pearce in the past or have been wanting to give her a try, I think you can't really go wrong with Fathomless. 4. Unless you don't root for non-humans, maybe? I'm not always Team Human. 5. 1 out of 1 Mistys agree. † What's this? A note within a note? Yeah, I only like those feels in fairy tales. Add 'em to some YA PNR and I might have to cut you. Alyssa milano don't you mean Jodi Benson?or are u talking about the characteristics of Ariel and Alyssa being similar? Previous to reading this review I didn't actually know much about this book at all. I always hear luke warm reviews of her books and people seem to find them pretty average...and to be honest books like that don't tend to make to my TBR. However, I now really want to read this one- I love the idea of a sense of foreboding throughout the whole book and a dark streak- that is what I would want from a Little Mermaid retelling too! I haven't read anything else by Jackson Pearce, and so this was my first experience with her work. 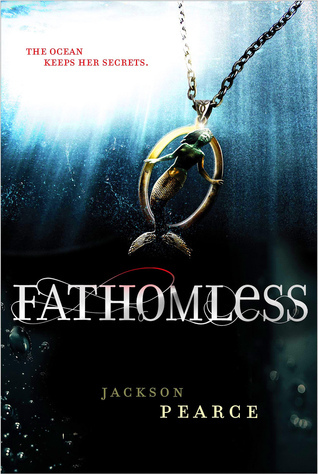 I was totally blown away by Fathomless. I love that she went back to the original roots of the tale, and held onto the darkness and the bleakness that surrounds the mermaids. Lo is not the redheaded daughter of Triton that most of us have grown up around. I've seen many reviews for this that were unfavorable because they were not expecting this at all. I guess they were expecting Ariel and the "Disneyfied" version of the fairy tale. I'm glad that Pearce chose not to go that route and because of that I really look forward to read her other retellings. I don't think she ever goes the Disney route, Bekka, and that's why I look forward to her retellings so much. She DOES hold on to the bleakness, and doesn't shy away from the unsavory bits of tales, and I respect that a lot. I loved this book. I am looking forward to Pearce's next untitled Fairytale Retelling of The Snow Queen. I know that story is very close to her and I think she will excellently tell it. Until then, I am going to have to read Purity soon, as it is the only Jackson Pearce novel I have to read.